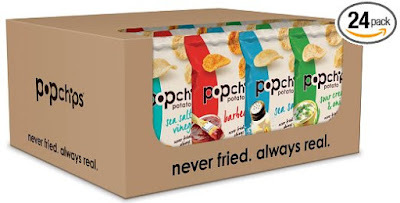 Here’s the skinny on popchips potato chips: A single chip is never enough to satisfy your natural craving for a crunchy snack. So do the sensible thing: stock up with a multi-pack or variety pack of popchips so you're ready to serve crowd sized portions. Popped potato chips, popped sweet potato chips, popped corn chips - you crave, it we pop it! Never fried, not baked & always real our popped potato chips have all the flavor & only half the fat of leading fried potato chip brands. Popchips are gluten free! Popchips have fewer calories & more chips per serving than other fried, baked or roasted potato chip brands. We created a new potato chip, one that’s deeply flavored but never deep fried. It's natural to want more than one - you won't lay down the bag!